ZigZag is a LEGO WeDo 2.0 robot that can follow lines on the ground, and can be remote controlled. Since the LEGO WeDo 2.0 set includes just one motor, I had to adopt a mechanism that allows the motor to drive both wheels, to make the robot able to drive and steer. Thanks to this two-way mechanism, the motor drives one wheel at a time depending on the direction it turns. This WeDo 2.0 robot proceeds in a zig-zag motion, hence the name. 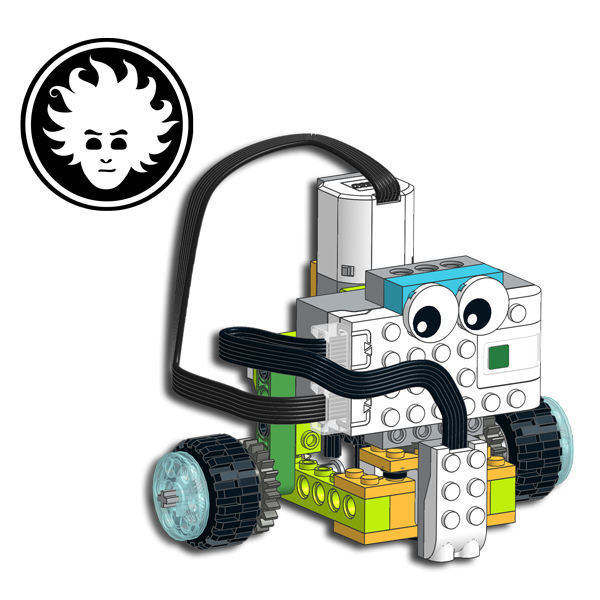 You can use this robot as inspiration to make other WeDo 2.0 robots that can drive and steer using just a motor. This line-following robot can be built with the parts from a single LEGO WeD0 2.0 set 45300.